Within the Information Technology program at Misericordia University, you will study the technical aspects of Information Technology to become a professional in the field, and gain important business writing and presentation skills, as well. Use of computers and standard software are integrated into instruction and assignments. Our flexible program allows you to tie your IT education to other areas of interest that will determine the direction of your career. In addition to courses in programming, systems, and applications, you can choose to specialize in IT Security. 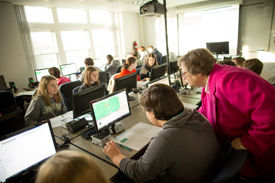 We are now offering new IT elective courses in Game Programming and Internet Programming. Click on the link to find out more about our specialization in IT Security. But your choices don't end there. You can tie your major in with business courses or with areas as diverse as philosophy or psychology, if that is where your interest lies. You'll be well-prepared for graduate school, if that's what you decide to do. With our liberal arts curriculum, you'll have the knowledge and thinking skills it takes to succeed. You'll also serve internships directly related to your major that will give you experience and connections in the business world. A Management Information Systems (MIS) sequence is also available through the Business Administration major. Technology management, among many others. Your bachelor's degree will prepare you for a variety of other possibilities, too, including career changes and growth to leadership and management positions. * IT Electives can be CPS 232, CPS 331, CPS 341, CPS 351, CPS 485, ACC 101, BUS 471 or other courses approved by the program director. This course will include coverage of the nature and scope of economics, scarcity and choice, the U.S. economic system, the role of supply and demand, production, cost and profit, perfect and imperfect competition, money in the U.S. economy, the Federal Reserve and the money supply, measuring output and income in the U.S., macroeconomic models/analysis, employment, income distribution, business cycles, microeconomic policies, national debt, and international trade. May not be taken after completion of either BUS 205 or BUS 206. An introduction to web design principles and production techniques. This course features hands-on exploration of web design and communication theory. Subjects covered include HTML, interface, graphics, and multimedia. Problem-solving methods; algorithm development; procedural and data abstraction; and program design, programming. Intended for students who plan to continue with other computer science courses. Control structures, top-down programming and stepwise refinement. Debugging, testing, and documentation. Prerequisite: CPS 101 or knowledge of language used in CPS101 and permission of instructor. This course is an introduction to the design, development and maintenance of web pages and web sites. The course covers the basic techniques of web page design and development. Basic concepts of computer systems and computer architecture. Machine and assembly language programming. Organization and structure of the major computer components; mechanics of information transfer and control within the digital computer system; fundamentals of logic design and computer arithmetic. Prerequisite: CPS 101 or permission of the program director. File terminology, structure, and manipulation techniques. Sequential and random access bulk storage devices. Applications of data structures and file processing techniques. Introduction to COBOL. Design and analysis of non-numeric algorithms, particularly for sorting/merging/searching. Algorithm testing and complexity. Prerequisite: CPS 121 or permission of the director. Organization and architecture of computer systems at the register-transfer and programming levels; operating systems principles; inter-relationship of the operating system and the architecture of computer systems. Prerequisites: CPS 222 or permission of the program director. Features, limitations, organization, and run-time behavior of programming languages. Formal study of programming language syntax, grammar, and data and control structures. Examples of language implementations. Continued development of problem-solving and programming skills. This course provides hands-on experience developing computer games. The course covers the basic techniques of game programming, including graphics, events, controls, animations, and intelligent behaviors. Students design and implement computer games. This is a course which will develop the basic programming skills needed to develop advanced webpages for the Internet. It will use a programming language that interfaces with webpages using Web 2.0 technologies. Prerequisites: It is expected that through prior courses the student is familiar with the concepts and theories of the internet and webpages. Concepts of social value and valuations; the effects of computers on society; professional ethics in decisions concerning social impact; and tools and techniques used to solve problems related to social consequences of computers. Design techniques, organization and management of large scale software development. Students work in programming teams on a major development project. Course is equated with MIS 312. Prerequisite: CPS 121 and one of the following: COM 215, CPS 215, CPS 432 or MIS 310; or permission of the program director. Introduction to database concepts, data models, data description languages, query facilities, file, and index organization. Data integrity, reliability, and security. Students work with real database management systems. Academic study combined with work experience in the community. Special investigation of a selected topic. Topics vary from semester to semester and will be announced with pre-registration information. This course provides a broad-based overview of information technology security. Emphasis is placed upon concepts and theory. Topics include access controls, network security, security management, application controls, physical security, disaster recovery, privacy laws, IT security ethics and security trends. This course will emphasize security management and risk assessment in relation to information security. Topics include security management responsibilities, the organizational security model, data classifications, policies, procedures, standards, and guidelines. This course will emphasize access controls and security models related to information security. Cryptology will be covered from a theory perspective. Topics include main access controls models, administration access controls, the importance of the orange book importance, integrity goals and cryptology. This course will emphasize privacy and legal issues in relation to information security. Topics include applicable laws, investigation, ethics, identification, protection, prosecution, liability, and the key role of privacy. This course will emphasize physical security and disaster recovery in relation to information security. Topics include physical security, environmental issues, contingency planning, and recovery and restoration. This course will emphasize current trends and issues in relation to information security. Topics include issues and trends facing CSOs (chief security officers), CPOs (chief privacy offices), and CIOs (chief information officers) and the providing of relevant technology to their clients and end-users. This course examines recent advances and new applications in the field of computer networks and telecommunications. Technical fundamentals, architectures and design of computer networks, strategies, tools and techniques of network planning, implementation, management, maintenance, and security are also covered. This course provides a study of an object-oriented programming language as it pertains to managerial applications. In addition, the course introduces the use of object-oriented programming methodologies. Software development and procurement is an important part of information system design. This course emphasizes a disciplined approach to analyzing requirements and specifications; designing; implementing through programming, procurement, and reuse; delivering with adequate testing and documentation; and maintaining by adapting and extending the application software for an information system. An examination of the relevant management issues in information technology and their impact on a firm’s competitiveness. Case study method is used. Senior status only. 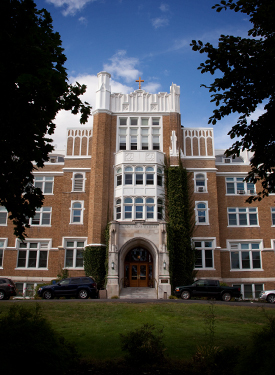 Misericordia University's highly qualified faculty will welcome you on an academic and a personal level. Our faculty build close relationships between students and professors that allow you to fully explore your area of specialization while you gain the basic knowledge and skills you need to succeed. If the demands of college-personal as well as academic-sound a bit scary, our Student Success Center offers a variety of support services for all students or the opportunity to help others through peer support and tutoring programs, as well as working with professional counselors. Successful freshman applicants to Misericordia University's Information Technology program will typically have a minimum grade point average of 2.5 and a combined SAT score of 850 (math and critical reading) if taken prior to March 5, 2016, or a combined score of 930 if taken after March 5, 2016. In lieu of the SAT, ACT results may be presented with a minimum required composite score of 18. Successful transfer applicants will typically hold a minimum collegiate grade point average of 2.0, having completed at least 5 college credits. Misericordia University reviews individual applications carefully, and the above stated standards should be seen only as general guidelines.